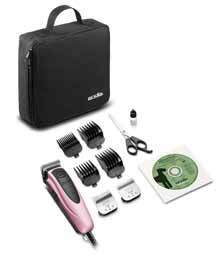 The Andis 12-Piece Easy Clip Grooming Kit is a powerful and comfortable clipper with three easy-to-use interchangeable blades that are easy on your pets. 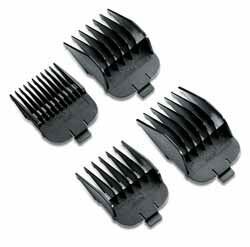 It comes with Safeguard Combs with rounded tips for pain-free grooming. The kit is ergonomically designed for maximum comfort and prolonged use. You can now style your favorite pets like a pro while keeping your house and clothes fur-free. All it takes is one go-around and your pet is looking good. This is truly a pro-quality clipper set. With a 75 percent more powerful motor than a typical home use clipper, the clipper can get through those tough coats but will also trim in detail. It comes with a step-by-step DVD with complete dog grooming instructions. The blades really give this clipper some extra finesse. 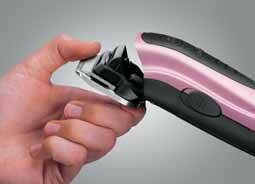 With the quick-release button you can change out blades with ease and convenience. Trim to a thin coat with the size 10 blade (1/16-inch) or just clip to a medium length with the size 7FC blade (3/8-inch). Just clip the blade in and you’re ready to go. And the blades are compatible with various other models for extended use. The set gives you the power of a professional with your style. 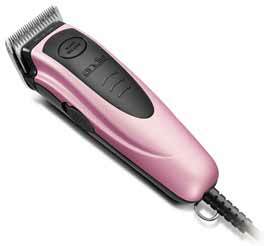 It will give you a powerful trim without scaring sensitive pets, all while looking stylish with its pink exterior. So now you can style your pets in style! The kit includes: One clipper, 3 interchangeable blades (sizes 10,7FC, and 4FC), 4 Safeguard combs for use with size 10 blade (1/4-inch, 1/2-inch, 3/4-inch, 1-inch), one step-by-step DVD, stainless steel shears, clipper oil, and one durable storage case.